Technically, there are only three characters in this photo from The Real World?. Photo by Cylla Von Tiedmann. We’ll never quite understand why some audience members aren’t interested in sticking around to ask questions during post-show talkbacks. If your parking’s about to expire, or you have a very early morning, sure. But if you’ve stayed to the end of the play, then you must have questions about what you’ve just seen. This is especially true when the show is as full as secrets as Michel Tremblay’s The Real World?, in English translation by John Van Burek, which director Richard Rose has brought back to the Tarragon Theatre 23 years after his last production of the play there. More on the talkback in a bit; but first, the plot. Aspiring playwright Claude (Matthew Edison, a successful playwright himself) has arrived at his parents’ house for dinner just as his travelling-salesman father Alex (Tony Nappo) is returning from a business trip. Father and son couldn’t be much more different (the former has a forced jovial manner, the latter is sullen and caustic), so Claude is clearly there for a reason other than his father’s company. When Papa goes for a bath, Claude asks his mother Madeleine (Jane Spidell) if she has read the draft of a new play he had left with her. She has, and she’s deeply upset by the fact that the family he portrays in the manuscript is a thinly disguised version of his own. As Madeleine explains her many objections to the play, we begin to see alternate versions of her (Meg Tilly) and Alex (Cliff Saunders) performing scenes in the same living room space. So the play within the play (and there may be even more layers than that) takes place simultaneously, and we begin to understand that Claude has poured a lot of resentment and anger into his work. This becomes even clearer when his go-go dancer sister Mariette (played by Sophie Goulet and Cara Gee) arrives for dinner, and more terrible family secrets are slowly revealed. The talkback after the show addressed many fascinating aspects of The Real World?—at least, for the half of the audience that stuck around post-curtain. While the play seems similar to barely disguised autobiographical family dramas like Euguene O’Neill’s Long Day’s Journey Into Night, director Rose explained that The Real World? was actually written as a form of apology from Tremblay to his immediate family, who’d already voiced their opposition to his airing of their dirty laundry in earlier work. Claude is morally conflicted enough over his use of family history that we could buy The Real World? as a mea culpa from Tremblay. Rose also said that Spidell, who played Claude’s mother in this production, had played Mariette in his 1988–89 staging. Spidell offhandedly mentioned that the earlier production staged “real life” and “play life” on separate sides of the stage. The “new” staging, then, seems to us to be one of the most fascinating aspects of the production. Seeing the two different realities rub up against each other without actually interacting (save for at a few subtle moments) on designer Charlotte Dean’s set—a note-perfect replica of a Quebecois 1970’s home—is never confusing. 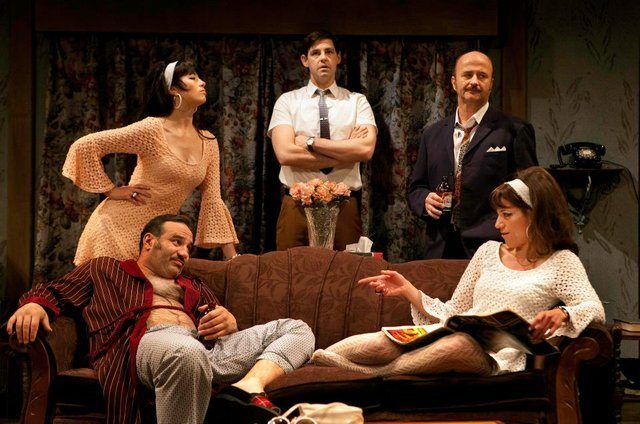 The connection and similarities between the two plays constantly reveal new truths about the family. And who’s to say there are only two realities? The play leaves open the possibility that its “real world” is just a later version of the play Claude wrote—or that it foreshadows a soon-to-come, differently balanced draft. Either way, by the end of the show we’ve seen both sides of the debate over accuracy and family loyalty. Spidell’s Madeleine and Edison’s Claude do a creditable job of articulating those points. Nappo’s barely restrained smarminess (and later, shame and fury) shines through, while Saunders manages to instill some humanity in a character written (by Claude) to be irrevocably loathsome. Tilly’s determined Madeleine is an inspiring heroine, before her namesake starts to tear her down. Meanwhile, both Gee and Goulet make impressions with their turns as the strutting Mariette. That it’s still hard to judge right from wrong in the script-within-the-script is a clear sign the production is doing justice to the material.